Writing about sewing machines, keeping your dog safe when it’s Bonfire Night, the changes to Facebook and how they affect businesses, inheritance and virtual reality’s impact on the sport of bodybuilding. Such is the varied life of a blogger. And sending out invoices while wondering about the viability of writing for a living*. Over-estimating children’s appetite for sweeties. 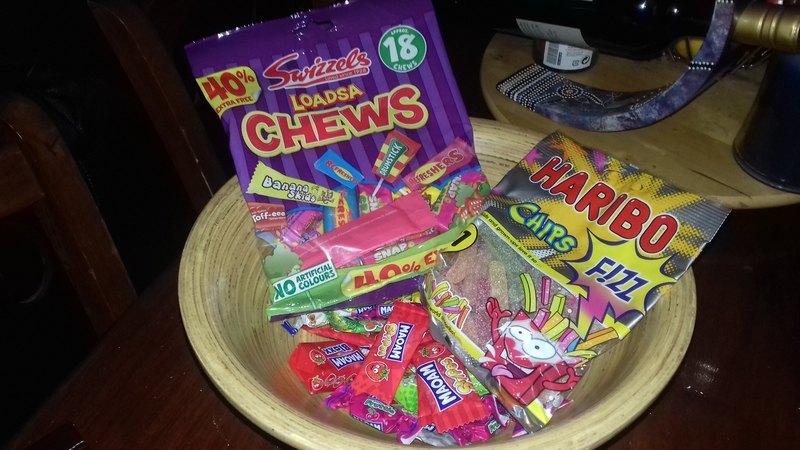 The very well-behaved guisers who called at our house only wanted one or two sweets. Or maybe my offerings (see above) were rubbish. Anyway, as they have a use-by date sometime in the 2020s (ahem), they’ll last another few Halloweens. Reflecting on the genius of the Duffer Brothers. Seriously, is there anyone who doesn’t love Stranger Things? The second series is even better than the first, and I binge watched my way through it this week. Avoiding Twitter because I was too busy binge-watching Stranger Things to tune in for the Great British Bake Off final, and saved it up for another night instead. Apparently, I needed to avoid Twitter anyway because judge Prue Leith gave the game away 12 hours ahead of the show being aired. Wishing my great aunt a happy birthday, her 103rd anniversary… Bodes well for my genes, I suppose. Trying out new recipes. Like most people, I recycle the same old favourites repeatedly. I bought the Sainsbury’s and Good Food magazines for October and tried out the Budget-friendly Pot Roast, Szechwan Chicken Wings, Egg-fried Rice, Steamed Seabass, and Broccoli, Pea and Mint Soup. Applying for jobs. My conversion rate is about one in ten. I really need to up the number of applications I make (I do ten a week), but I live in fear that one day all ten (or even five) potential clients will come back at once, and need delivery at the same time. Looking into BookBub as a promotional tool. More promising than Facebook or Amazon ads, apparently, as your audience are purely voracious readers. Running. I’ve rediscovered a love for pounding the pavements. When you’ve been inside all day, a run in the dark, rainy weather works wonders. Writing about vampires, friendship and betrayal. Once the paid work is dealt with, I do what I love – creative writing. (And you can read my stories on Wattpad here – https://embed.wattpad.com/follow/SavvyDunn?type=2) One day, one day, perhaps the stars will align, and the creative work will become the paid work, earning me enough money to make a small income. Nothing greedy. If blogging for a living has taught me anything, it’s how to make do with a lot, lot less. I completely relate to the ‘will they, won’t they’ aspect of freelancing – it wasn’t for me, the uncertainty played havoc with my peace of mind! Those sweets would never last until next Hallowe’en in my house! They may not yet… Though, if I eat the nougat ones, maybe I’ll turn feral and eat my cat???? Interesting post, Emma. Thanks also for the link to your stories on Wattpad … looks like some good stuff is there. Hope you’re doing well. Thanks Russell – and you too.